Learn about the values at the very heart of Leslie’s nutritional and healing work with the animals. When humanity causes a problem, nature provides a cure. The only way to provide natural support to the immune system, and the myriad of interconnected bodily systems, is by feeding wholesome and healthy balanced nutrition. Discover why our sprouting blends provide the simplest solution as you learn how to feed your flock a ‘Balanced Exotic Avian Food Plan’ based on each bird’s unique needs. Why I Created the Best Bird Food Ever! Learn the story behind Leslie’s goal to End Avian Malnutrition. Parrots must eat hundreds of nutrients every day. Learn how our bird food takes the guesswork out of feeding your flock balanced nutrition. Learn why less is more, when feeding our sprouts. If you like investigative journalism, you’ll love the facts in this classic article by Leslie. Because our sprouting blends were created for a purpose: to End Avian Malnutrition, we explain when to feed our Wheat-Free Blend. New to sprouting? Get everything you need to begin sprouting today. Learn why it’s essential to feed your birds an easy to digest form of complete protein. We offer 1# and 5# bags, and a 25# box (includes FREE shipping). A 1# bag of either the Original or Wheat-Free Sprouting Blends makes more than 9.5 cups of delicious sprouts. For best results, feed our sprouts everyday. Detailed chart of 19 nutrients, some categories list specific nutrients, compare our sprouting blends to other parrot foods. Graphic image of all the nutrients our Sprouting Blends Contain. A detailed article explaining why our Sprouting Blends provide your parrots and finches the highest nutrition possible from properly grown sprouts. All sprouting blends are not created equal. See how ours outshine the rest. The 5 most important things to look for in a sprouting blend for your parrots, and learn how we’ve made balanced avian nutrition easy for you. 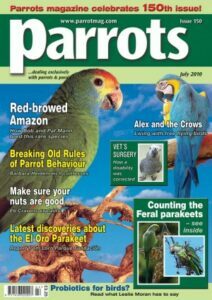 What is Holistic Health Care for Parrots? My goal is to End Avian Malnutrition, for exotic birds (parrots and finches). My focus is national, across the US, and international. Avian malnutrition is the leading cause of illness, disease and early death of these amazing animals.